Celebrate Coach John Wooden’s life as SUCCESS Academy commemorates his legacy with a collection of timeless video footage, lessons, and interviews with the men and women fortunate enough to learn from a legend. Presented in a documentary style format, this inspirational short film “Coach: The Life and Legacy of John R. Wooden” sheds light on the man behind the success. You’ll see firsthand how Coach Wooden’s legacy extended far beyond the court, to touch the lives of millions, all through his relentless pursuit of the fundamentals. We’ve scoured the vaults, spent countless hours of exhaustive research, and have been embraced by the vast network of Coach’s disciples to bring you this rare look into what it really takes to become a champion. Discover the life story of how one man turned humble beginnings into a dynasty and legacy that extended far beyond the court. 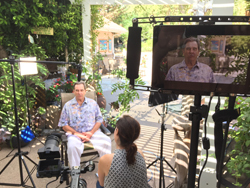 Emmy award winning actor Beau Bridges, who played ball for Wooden at UCLA, is one of dozens of people interviewed for this documentary and upcoming e-learning course. In this interview, Bridges shares the impact that Coach had on him. But it wasn’t until years later that Bridges understood just how big an impact Wooden and his iconic Pyramid of Success had on his life. “I don’t think I understood the profoundness of it until I got a bit older and finished playing basketball. Yeah, it’s about basketball, but it’s about life,” Bridges says. You’ll also hear from John Wooden himself as he shares his humble philosophy for life and winning. Our talented e-learning division SUCCESS Academy presents the documentary short here exclusively on TheWoodenEffect.com. Now enrolling: Begin studying John Wooden’s Pyramid of Success with this one-of-a-kind online course presented by SUCCESS Academy. Click below to share and invite a fan of John Wooden to watch!